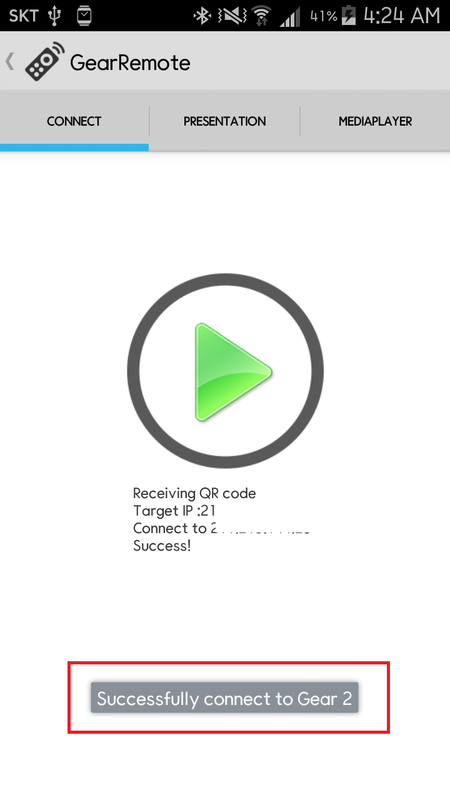 아래 버튼을 눌러 OnBarcode.Barcode.RS2008.dll 파일을 다운로드 받아 설치된 경로에 복사해 주세요. Download this file and copy the installed folder. This application is perfectly worked through the several test and beta test. 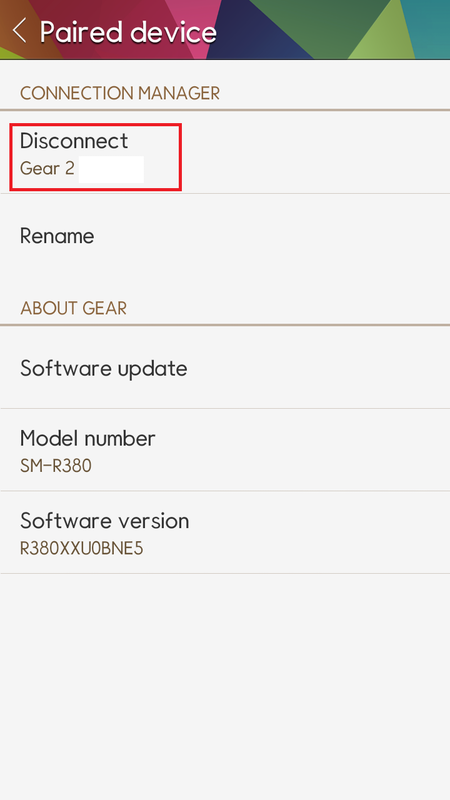 If you have some issue while using GearRemote application, read this document. 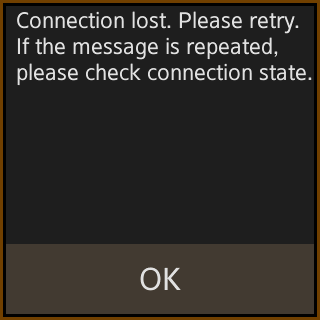 If the message of repeated connection failure is output, please try as follows. A. First, go to Active applications, and exit GearRemote. Then re execute GearRemote and try connect to PC again. B. Check PC and Android device connected to same network. 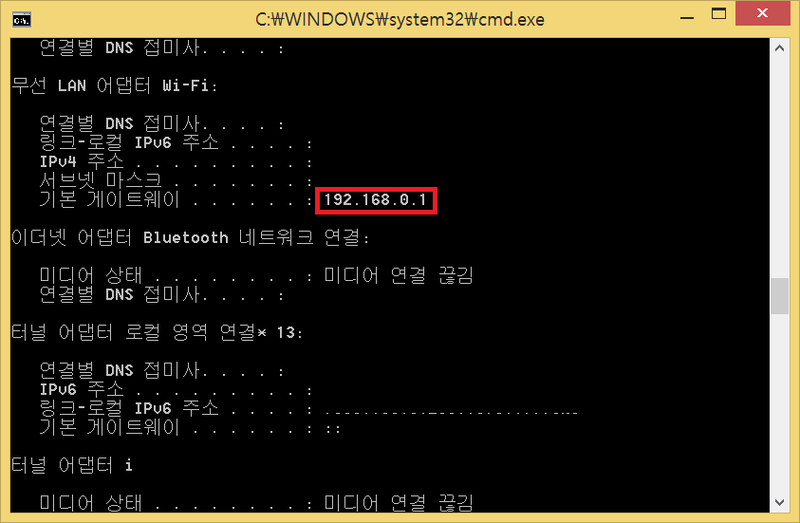 * If PC's IP address is public IP, it does not matter even if the network is not the same. But if the PC is assigned a private IP PC is connected to the equipment such as routers, you must also assign Android device private IP on the same network. 1. 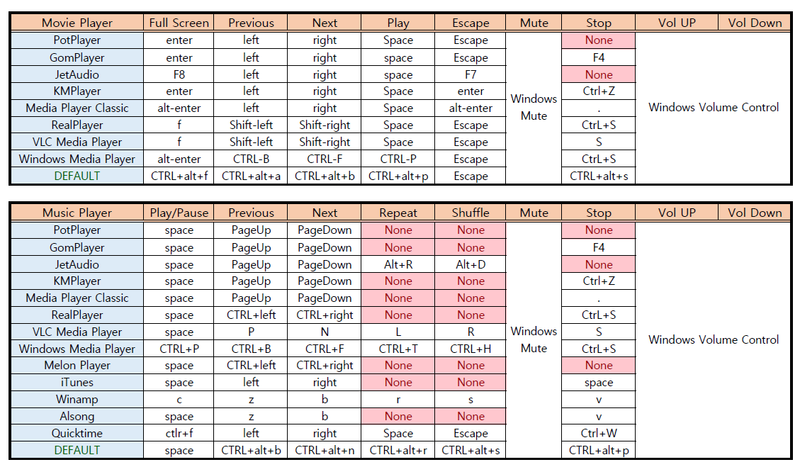 In computer, Start -> Run(Windows key + R) -> type 'cmd' and enter. 2. Type 'ipconfig' in command prompt. 3. Check default gateway address. 4. 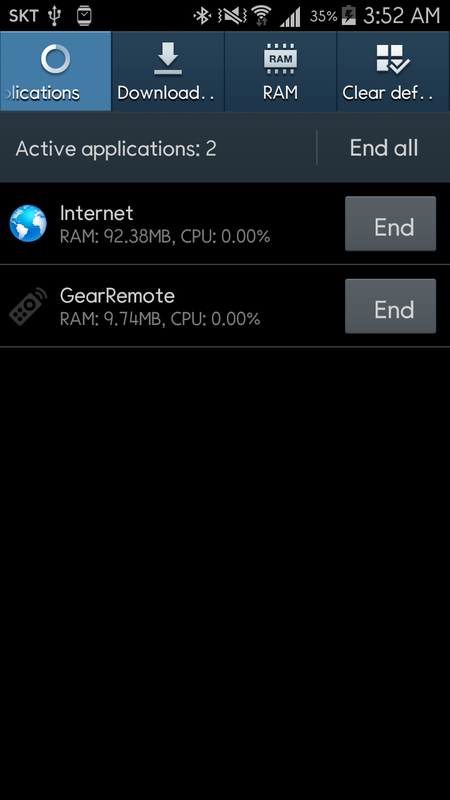 Execute GearRemote in your Android device. 5. Check gateway address in menu. This address must be the same on the Android device and PC. If this address is not same, PC and Android device is not connected on same network. In this case, if the PC is not a public IP is, it is not connected. C. Check your PC firewall. If PC have blocked this application through the firewall, please register on the exception, or disable the firewall. 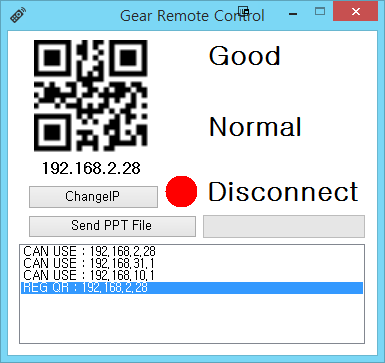 D. Change IP address in GearRemote for PC. You can change your IP. Press ChangeIP Button. Select IP in same network of mobile device. If firewall blocked 9102 port, this application can't work. Please open 9102 port. If PC and Android device success to connect, but all of function was not working through Gear, please try as follows. A. 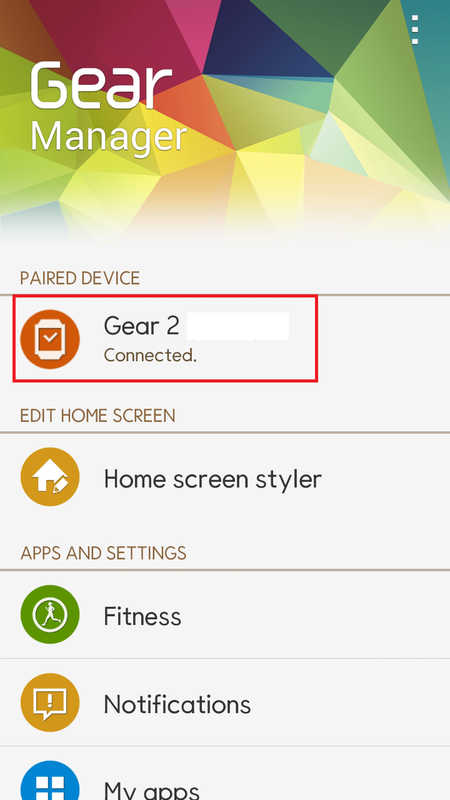 After you run GearRemote in Gear, please check 'Successfully connect to Gear 2' message when you click the function menu. Please refer to the third document if this message even though the appear if the function does not work. B. Please try as follows if 'Connection lost' message appear to Gear. 1. 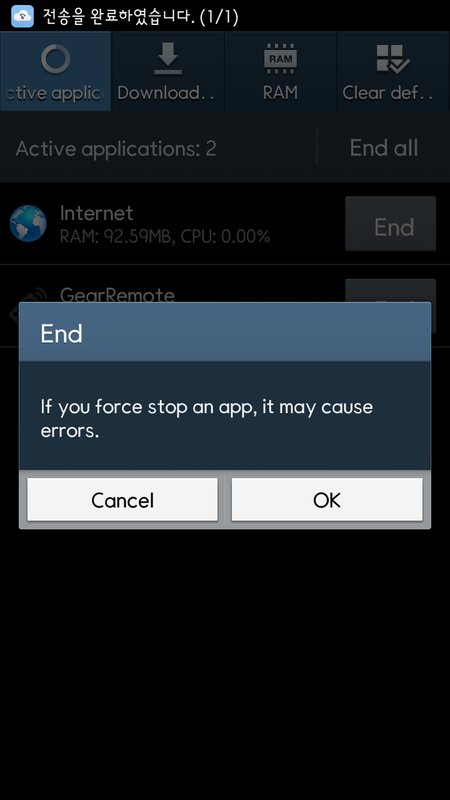 Run Samsung Gear Manager. 2. Disconnect Gear and re connect. 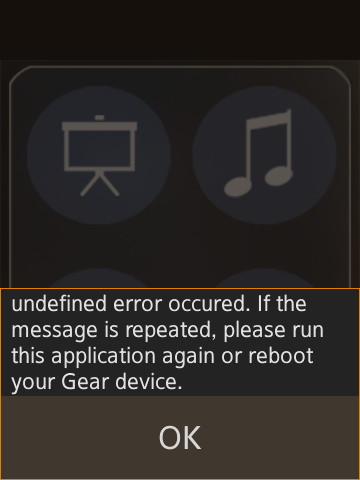 If you see undefined error, exit GearRemote for Gear. And re-execute this application. If you see back, reboot Gear. Then working perfectly. 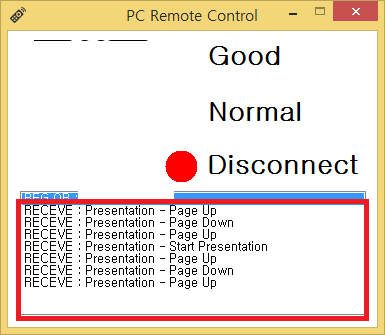 Run GearRemote for PC as administrator. And then check the bottom of the message list. Please make sure that the message is displayed correctly. If connection is normal, there is a possibility that the security program has blocked GearRemote for PC if all feature do not work. 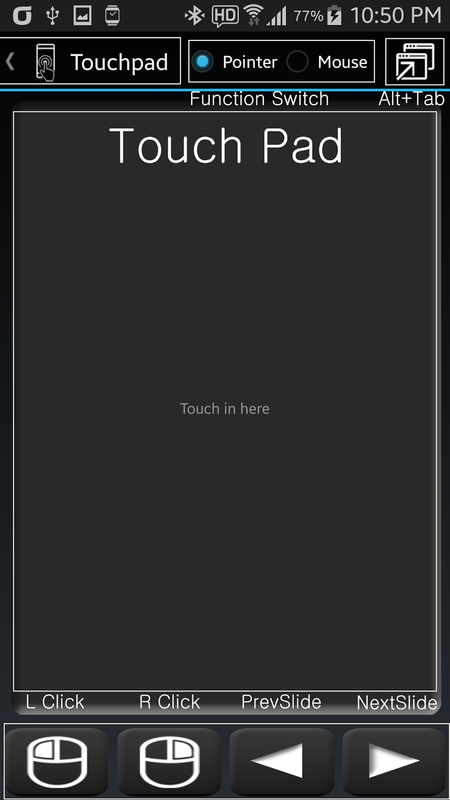 This application send 'key pressed' event Android device to PC, and execute received event on the PC. But if cut off the 'key pressed' event blocked by security program, this application will not be able to work. Please check your security program. Especially, if you use the keyboard security program, there is a possibility that this program is blocked. Please register to exception this application, if possible. This function may not work for a few seconds after the initial connection. Wait a while and can be used normally. 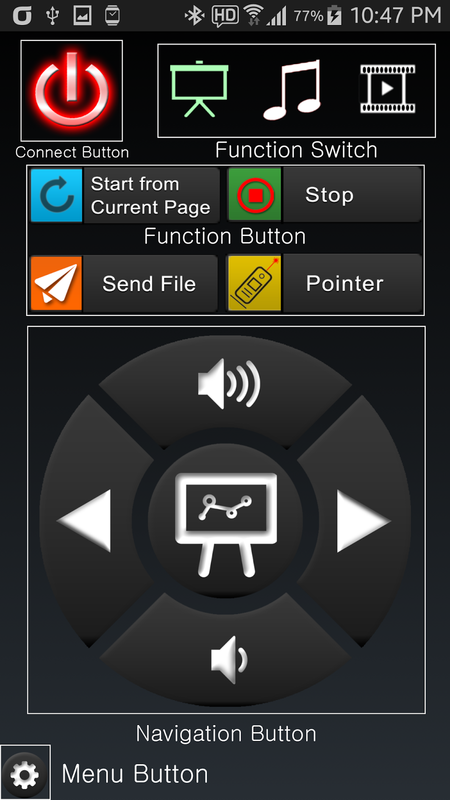 Media player(Music, Movie) function is detected that the player running in advance, and send short cut to PC. But Shortcut that is not compatible with the media player, and might have some features may not work. In the case of music player, if you are not in the currently active window, all functions that do not recognize the shortcut key will not work. 이 프로그램은 여러대의 기기와 베타테스트를 거쳐 완벽하게 동작함을 확인한 프로그램입니다. 만약 GearRemote를 사용하는데 문제가 발생한다면 이 문서를 읽어보십시오. 반복적으로 연결 실패 메시지가 출력될 경우 아래와 같이 시도해 보십시오. A. 먼저 실행중인 어플리케이션 화면으로 이동한 후 GearRemote를 종료하십시오. 그 후 GearRemote를 다시 실행 후 연결해 보십시오. B. PC와 Android 기기가 같은 네트워크에 연결 되었는지 확인해 보십시오. * PC가 사설IP가 아닌 공인IP라면 네트워크가 같지 않아도 상관 없습니다. 그러나 PC가 공유기 등과 같은 장비에 연결되어 사설IP를 할당받는 PC라면 Android 기기도 같은 네트워크에서 사설 IP를 할당 받아야 합니다. 5. 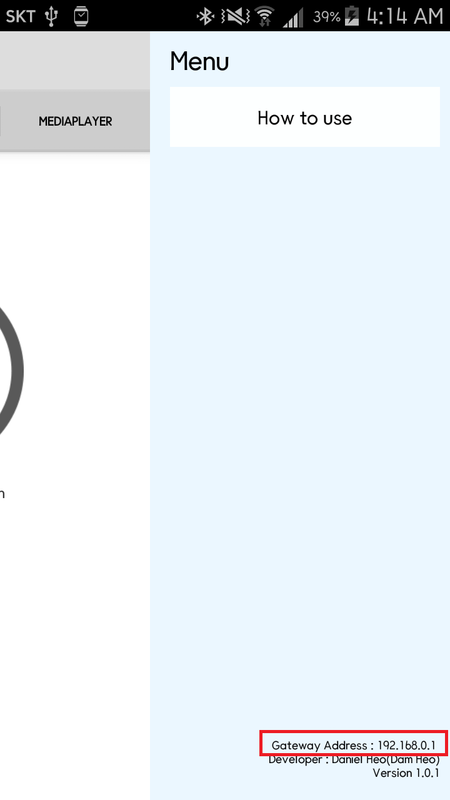 메뉴화면 하단 Gateway Address확인. PC와 같은지 확인. PC와 같지 않다면 같은 네트워크상에 존재하지 않는 경우입니다. 이 경우 PC가 공인IP가 아닐 경우 연결되지 않습니다. C. PC의 방화벽이 PC용 GearRemote를 차단하고 있는것이 아닌지 확인해 보십시오. 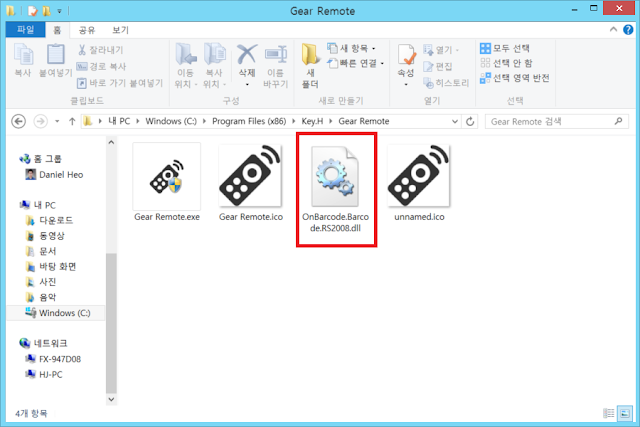 PC의 방화벽이 GearRemote를 차단하고 있을 수 있습니다. 방화벽을 잠시 꺼두시거나 GearRemote를 방화벽 예외 목록에 등록해 주십시오. D. PC용 GearRemote에서 IP를 바꿔 보십시오. ChangeIP 버튼을 눌러 리스트에 있는 IP로 변경이 가능합니다. 모바일 기기와 동일 네트워크에 있는 네트워크 어댑터의 IP를 선택해 접속해 보시기 바랍니다. 이 프로그램은 9102 포트를 사용합니다. 9102포트가 방화벽에 의해 막혀있다면 사용할 수 없습니다. 9102포트를 열어 주시기 바랍니다. Windows 기본 방화벽을 기준으로 설명하겠습니다. 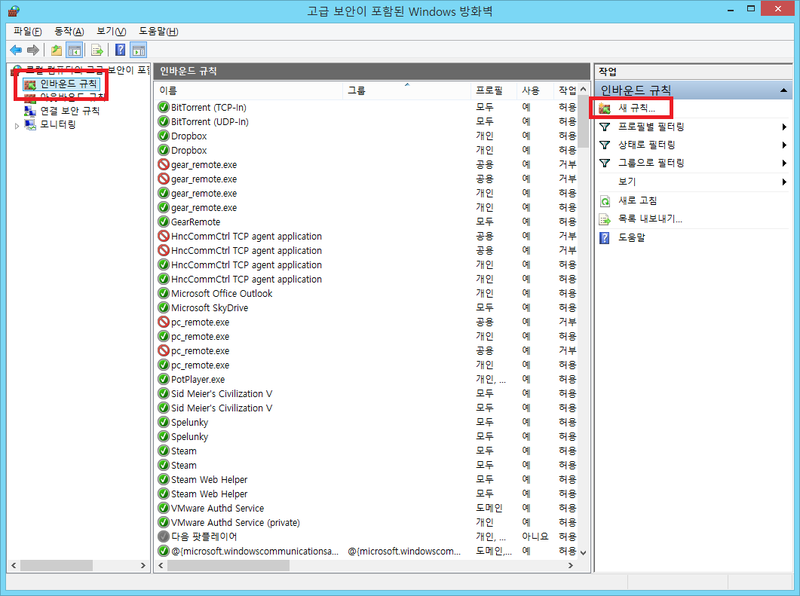 먼저 제어판에서 Windows 방화벽으로 이동합니다. 그 후 고급 설정을 클릭합니다. 인바운드 규칙으로 이동 후 새 규칙을 클릭합니다. PC와 Android기기가 성공적으로 연결 되었지만 Gear를 통해 어떠한 기능도 작동하지 않는 경우 아래와 같이 시도해 보십시오. 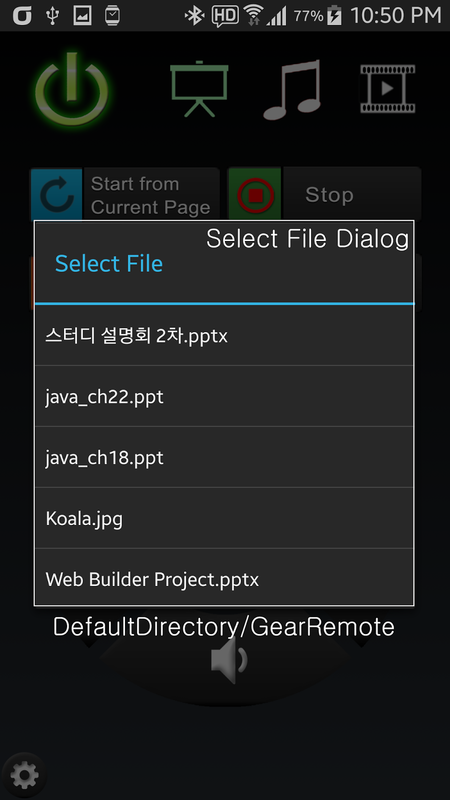 A. Gear에서 GearRemote 실행 후 기능 메뉴 클릭 시 Android 기기에 Gear와 성공적으로 연결되었다는 메시지가 나타나는지 확인하십시오. 만약 이 메시지가 나타남에도 불구하고 기능이 작동되지 않는다면 3번을 참고하십시오. B. Gear 2와 연결되었다는 메시지가 나타나지 않고 Gear에서도 연결 실패 메시지가 나타날 경우 아래와 같이 시도해 보십시오. 2. Gear의 연결을 해제하고 다시 연결해 보십시오. undefined 에러 발생시 먼저 어플리케이션을 모두 종료한 후 다시 실행시켜 보십시오. 그래도 작동이 안된다면 Gear를 재부팅 하시면 정상작동 하게 됩니다. D. undefined를 제외한 에러 발생시 모바일 기기와의 연결 문제이니 모바일 기기와의 연결 상태를 다시 한번 확인해 보시기 바랍니다. PC용 GearRemote를 관리자 권한으로 실행하십시오. 그 후 PC용 GearRemote 하단에 있는 메시지 목록을 확인해 보십시오. 정상적으로 메시지가 나타나는지 확인하십시오. 연결이 되었으나 모든 기능이 동작하지 않는다면 PC에 설치된 보안 프로그램이 PC용 GearRemote를 차단했을 가능성이 높습니다. 이 프로그램은 모바일 기기에서 PC로 키 입력 이벤트를 전송하고 전송 받은 이벤트를 내부에서 실행합니다. 그러나 보안 프로그램이 프로그램을 통한 키 입력을 차단한다면 이 프로그램은 동작될 수가 없습니다. 보안 프로그램을 확인해 보십시오. 특히 키보드 보안 프로그램을 사용한다면 이 프로그램이 차단되었을 가능성이 높습니다. 이 프로그램을 예외 목록에 등록해 주십시오. 최초 접속 후 몇 초간 기능이 작동하지 않을 수 있습니다. 잠시만 기다리시면 정상적으로 이용이 가능합니다. 미디어 플레이어(음악, 영화) 기능은 미리 실행중인 플레이어를 판단하고 그 플레이어에 맞는 단축키를 해당 기능에 할당하여 기능 선택 시 해당 단축키를 컴퓨터에 메시지로 보내 동작하게 됩니다. 그러나 미디어 플레이어마다 지원하지 않는 단축키가 많아서 일부 기능들이 동작하지 않을 수 있습니다. 음악플레이어의 경우 현재 활성화된 창으로 되어 있지 않으면 단축키를 인식하지 않아 모든 기능이 동작하지 않게 됩니다. 이 문제는 해결중에 있으며 일부 플레이어는 백그라운드에서도 메시지를 받아 동작하게 됩니다. 추후 지원 플레이어를 늘려갈 예정입니다. If you want to English page, click HERE.